Never having been suicidal and near Beachy Head at the same time I had no idea of the existence of the Beachy Head Chaplaincy Team. Way Back, now playing at the Brighton Fringe imagines the interaction between a worker for the slightly renamed Beachy Head Chaplaincy Service and two potential jumpers at the world-famous suicide spot. Since 2004 the real-life BHCT organisation of Christian volunteers has patrolled the cliffs in East Sussex, spending over 100 hours a week at the top of the cliff. They are ready to talk to anyone, but especially those who have visited the beauty spot with no interest in the view. Not an easy undertaking, but they have successfully reduced the local suicide rate. A willingness to tackle difficult issues is good to see in a comedy writer, but Daniel Henry Kaes has taken a risk for the follow up to his successful debut play It’s Complicated. Depression and suicidal thoughts are hard to replicate or imagine for those who haven’t experienced them. It is easy to confuse depression with unhappiness and suggest pat answers that don’t understand the seriousness of the condition. Basing a character on a member of a clearly identifiable real-world organisation is also hazardous, requiring careful research to avoid inconsistencies with the way such an organisation really works. Carol is our youthful hero wearing a hi-vis orange Beachy Head Chaplaincy Service jacket. Aynsleigh Turner imbues Carol with an endearing mixture of inexperience and enthusiasm at the start of what turns out to be busy cliff-top shift. Paul Carroll, dressed like a member of Bros, delivers the play’s funniest lines as self-absorbed pop star Rodney, sorry, Randy, who’d been hoping for more paparazzi to witness his demise. Matt Lim in tracky-Bs and a Superdry top gives an intense performance as Miles, a chef whose depression has brought him to the edge of the cliff. A strip of AstroTurf represents the last few metres of England, 530 chalky feet above the Channel. The tenor of the piece is embodied in this fake grass – it is not quite serious yet not entirely amusing. All serious or all flippant and it might have worked. But with suicide as the subject matter, the aim for balance was always going to be tricky. The jokes about hoax jumpers might have been funny if they fitted with the overall tone, but given the context they and other moments concerning child-abuse and Ugandan attitudes to homosexuals are distasteful. Statistics are hard to find but at least 26 people died at Beachy Head in 2008 alone and it is claimed to be the 3rd most popular suicide spot in the world. To be suicidal and threatening to jump off a cliff is a serious matter. However the dialogue sounds like that of men sitting in a pub, not standing a gust of wind from certain death. If Miles is seriously about to jump his humour lacks the real self-deprecating, self-hatred of the suicidally-depressed. Monologues are used well, comedically welcoming the audience into the characters’ minds and showing their differing interpretations of the same events. Carol is the fulcrum over which the others balance but she has her own issues which suddenly tumble out, Turner conveying the deeper sadness that has been lying underneath the character’s bubbly exterior. The audience enjoyed enough laughs to suggest that Kaes could write a comedic winner in the future. However Way Back is a work in progress on that journey. The writing doesn’t convince that suicide is imminent, the links that appear between the characters are extremely strained and Miles’ reaction to a last minute revelation puts in doubt whether he was suffering from depression at all. However Carroll’s deliberately camp delivery and Lim’s obvious commitment are positives even if the play ultimately misunderstands its own subject. Way Back draws attention to the the work done by the Beachy Head Chaplaincy Service. As you can imagine they need money to continue saving lives. You can find out more about them and donate here. 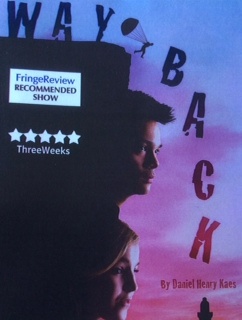 Way Back is on during May at the Brighton Fringe 2014.